In honor of the 501st Anniversary of the posting of the 95 Theses on the sale of indulgences, here is a nice bit of information about Luther’s seal. It is authored by and reprinted here with the permission of the Rev. Paul McCain; originally appearing on his old blog Cyberbrethren. What does the "Luther Rose" mean? 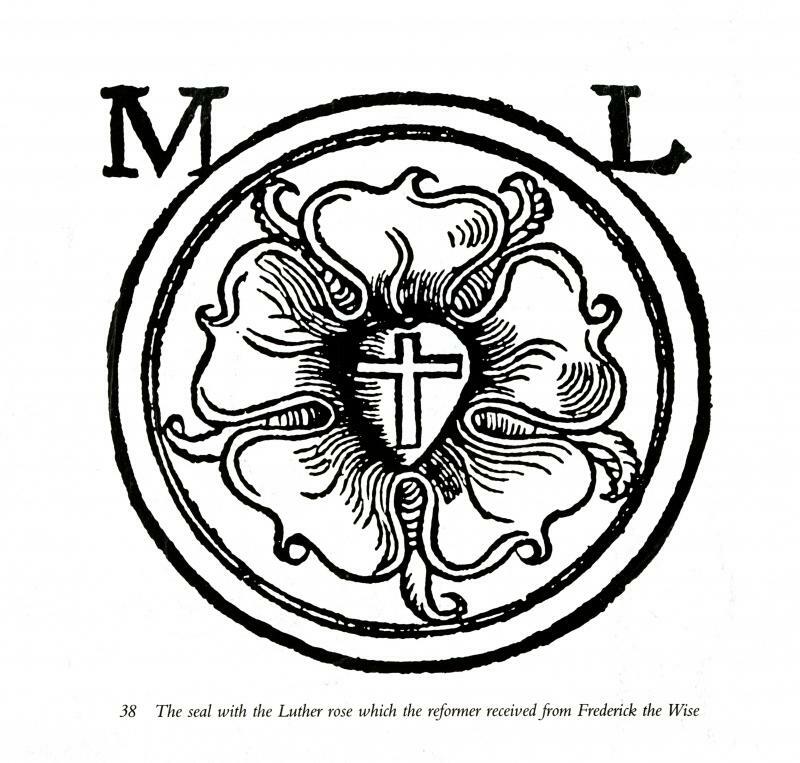 Luther’s seal, or as it is sometimes called, Luther’s rose, is the most widely known symbol of Lutheranism. It’s origins are interesting. Luther was invited to create a personal symbol to summarize his faith in the 1520, as his writings became increasingly popular, there was a desire on the part of the Wittenberg printers somehow to try to indicate what was an authorized publication of Luther’s works, and so they asked Luther to tell them what he would like to have as his personal mark on his published works. I put a copy of the first known printed version of the seal, further down in this post. It was very common in Luther’s Day for public servants, theologians, political rulers, and others of some public note, to have a personal seal. In 1530, Prince John Frederick wanted to give Luther a gift of a signet ring, as an expression of his appreciation, love and respect for Dr. Luther. The gift was personally presented to Luther, by Prince John, at the Coburg Castle on September 14, Holy Cross Day, when the Prince stopped at Coburg while traveling back from the meeting in Augsburg. The Coburg Fortress was the southernmost fortified property in what was then Electoral Saxony. Luther could not attend the Diet of Augsburg, but had to remain behind in Coburg, since he was still considered by the Emperor, Charles V, to be a public criminal, not to mention the fact that he was also considered a heretic and excommunicated by the Roman Church. Lazarus Spengler, of Nürnberg, apparently helped to have the ring prepared, he asked Luther for an explanation of the seal. Luther offered both an explanation and also an indication of the colors it should contain. This was somewhat unusual, for full color seals were very rare, in these early years of printing. Any four-color image in a book would have to be provided by hand. The ring was a thank you from John Frederick to Luther, in return for Luther having dedicated his translation of the Book of Daniel, to the Prince. Johann Frederick was, in my opinion, the greatest lay-hero of the Lutheran Reformation. “Grace and peace from the Lord. As you desire to know whether my painted seal, which you sent to me, has hit the mark, I shall answer most amiably and tell you my original thoughts and reason about why my seal is a symbol of my theology. The first should be a black cross in a heart, which retains its natural color, so that I myself would be reminded that faith in the Crucified saves us. ‘For one who believes from the heart will be justified’ (Rom. 10:10). Although it is indeed a black cross, which mortifies and which should also cause pain, it leaves the heart in its natural color. It does not corrupt nature, that is, it does not kill but keeps alive. ‘The just shall live by faith’ (Rom. 1:17) but by faith in the crucified. Such a heart should stand in the middle of a white rose, to show that faith gives joy, comfort, and peace. In other words, it places the believer into a white, joyous rose, for this faith does not give peace and joy like the world gives (John 14:27). That is why the rose should be white and not red, for white is the color of the spirits and the angels (cf. Matthew 28:3; John 20:12). Such a rose should stand in a sky-blue field, symbolizing that such joy in spirit and faith is a beginning of the heavenly future joy, which begins already, but is grasped in hope, not yet revealed. And around this field is a golden ring, symbolizing that such blessedness in Heaven lasts forever and has no end. Such blessedness is exquisite, beyond all joy and goods, just as gold is the most valuable, most precious and best metal. This is my compendium theoligae [summary of theology]. I have wanted to show it to you in good friendship, hoping for your appreciation. May Christ, our beloved Lord, be with your spirit until the life hereafter. Amen.